Not the Indian Python or the Indian Rock Python, but, the Burmese Python… Python molurus bivittatus. These snakes are common in southern Thailand. Their coloring can be more on the lighter side or darker side, this one is rather dark. These snakes can get very large – approaching 30 feet. In the Everglades in southern Florida, once captive Pythons like this Burmese, have been let loose and have thrived in the hot climate. They are now attacking alligators and other wildlife, not to mention the occasional human being. The Burmese Pythons have a temperament that is somewhat more even-keeled than the reticulated Pythons – in general. There are also some very keyed-up Burmese Pythons that will take a hunk out of your flesh if you get too close. Here at the snake park they have about 8 Pythons – 3 of which can be handheld. 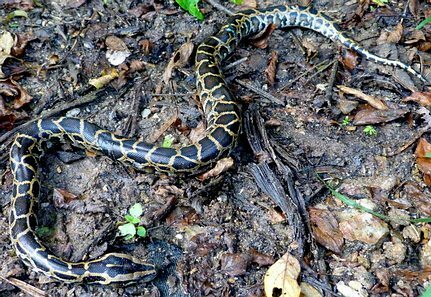 If you come to Thailand, the chance that you would see a python in the wild is VERY small. You would need to go looking for them. They love living in trees during the day and are active at night eating anything from frogs to goats. Burmese Python - Python bivittatus. Copyright 2011, Elliot Pelling - used with permission. Snakes come in all different colors. Even snakes of the same species can have quite different coloration depending on region, or sometimes just living next to each other in Thailand’s wild. This is a Burmese Python sent to me by a friend. Quite dark compared to most I’ve seen here in Southern Thailand. 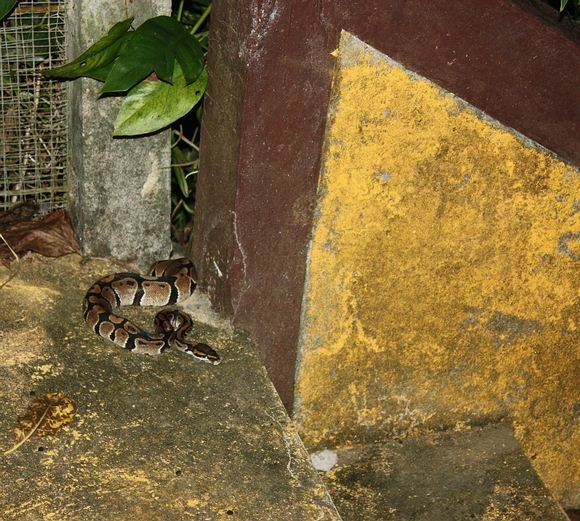 Recently a reader sent me some photos of a snake that very nearly bit him on one of the islands of Koh Phi Phi. When I looked at it – it was unmistakable what it was – a mangrove pit viper. However, it was brown tinted – quite brown. The guy verified it was brown, and not just a camera quirk. I’ve only seen them in a purple shade and with some yellow. Never brown. 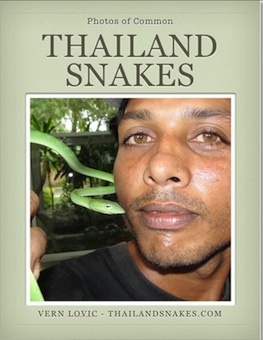 Goes to show you that it is very difficult to identify the 200 some snakes native to Thailand. It’s downright impossible many times from the photos I get. Even snakes I catch, some biologists cannot figure out what snake it is. PLEASE… do not touch snakes if you are not 100% sure what it is – and only if it is non-venomous. There are many snakes that have venom in Thailand – but that are classified as non-venomous, because typically they are not dangerous to man. 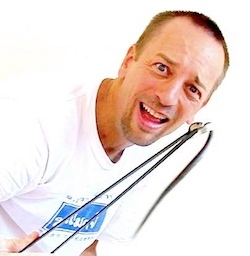 If you happen to be allergic to the venom though – guess what? You could be in anaphylactic shock before you know it. 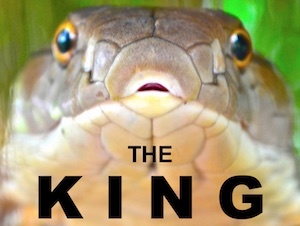 Recently a “non-venomous” snake put a teenager in the Bangkok hospital in Phuket for 2 weeks with failing kidneys. Be careful with snakes – all snakes – there are some that are quite obvious what they are, and there are others that I cannot figure out… and there are some that the biologists cannot figure out. Aime sent me a great photo of a Burmese python that was on her walkway. She knew it was a python and figured it wasn’t too aggressive, and in this case she was right. Burmese pythons are quite a bit less vicious than their cousins the Reticulated Pythons. Burmese Pythons can grow to 8 meters. Reticulated pythons can also get that big. 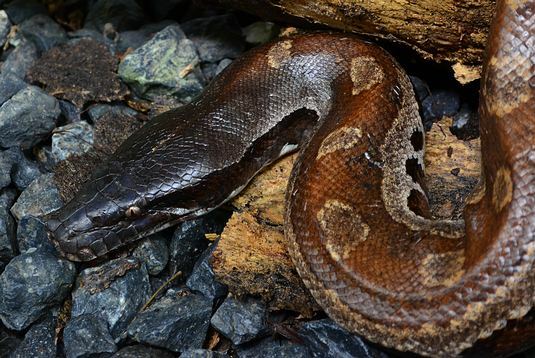 Blood Pythons very rarely get over 2 meters. Burmese Pythons (Python bivittatus) resemble blood pythons also – which are found in southern Thailand as far as Krabi province (we’ve found a couple here in Krabi). 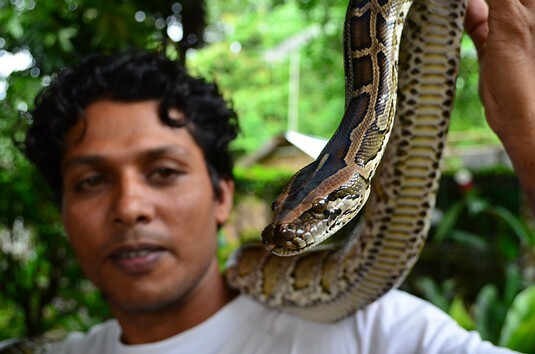 I didn’t know Burmese pythons or blood pythons to be found in Phuket though. Apparently they are. Note – these snakes can be confused with the deadly Chain Vipers – the patterns and colors are very similar to the untrained eye. Chain vipers, also called Russell’s viper – are found in and north and east of Bangkok mostly, not in Phuket or anywhere south of the Chumphon province area (so far). Copyright 2011 Aime Yodkaew. Published with permission. Update – check the comments, some are insisting it is not a Burmese python… I think they are right… must have been someone’s pet that was let free in the jungle, and comes around houses because it doesn’t fear people.